Heads up....A new role playing product for those of you that enjoy role playing the SL Gorean World. This product is suitable for both "By the Book" (BTB) or "Gor Evolved" (GE) role playing cities or sims. Works for any Tavern, Paga Tavern, Inns, Tea Houses, Free Women establishments, Public Kitchens, Restaurants, or, any place where food is served. Why not give some role play prompts or serving ideas to the Free and/or kajirae (role players) with this convenient role playing device? Simply hang it on the wall, touch to select one of the 7 pre-loaded meal menus. Voile...instant role play. It is 100% mesh with 5 editable faces so you can personalize this sign for your particular city or role play area needs. 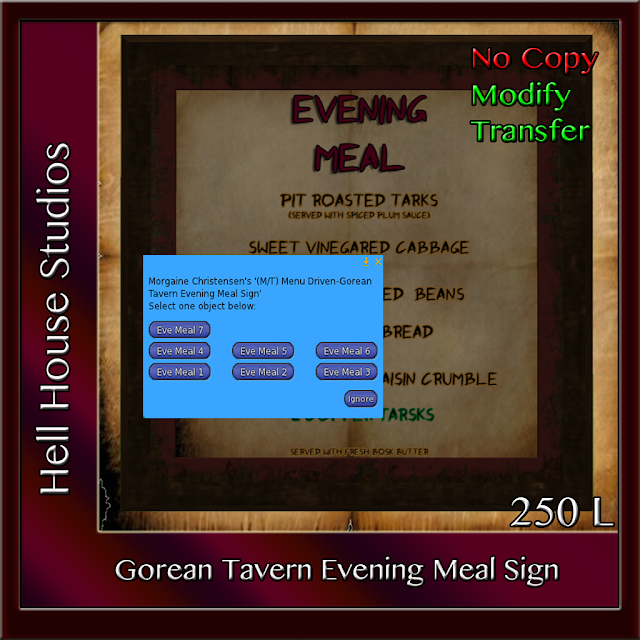 7 pre-loaded Gorean Evening Meal Textures included! I have revised/updated this particular blog entry due to posting it prematurely while ill. I hope it makes more sense now and is more inclusive. My apologies if the original was confusing. In Part 4, I skipped around a bit and discussed a little about graphics software needed for making Second Life "layered clothing". Before that, in Part 3, we started looking a little at the clothing templates, specifically the original template guides produced by Linden Labs. Today, we are going to do a bit more exploring of the Linden templates and see what other templates guides are available s available to help you with your "layered" clothing creations. 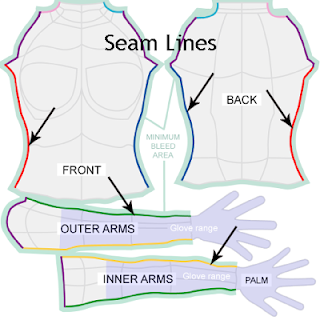 As far as I am aware, ALL other clothing templates are based on the Linden's basic templates each adding specific enhancementsor details to the templates making the templates easier for us to use.